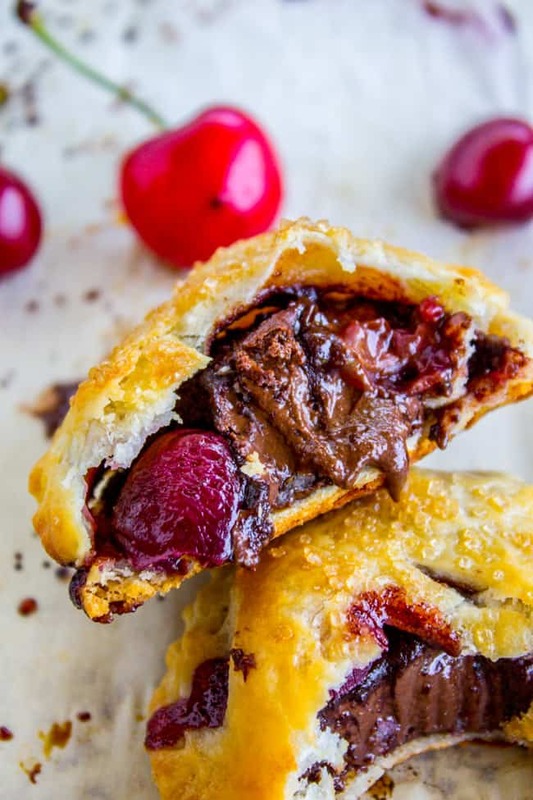 Flaky and buttery mini pies filled with fresh summer cherries and melty chocolate! The chocolate has a touch of almond in it. These are so perfectly cute it’s hard not to throw down like 8 at a time. I did the same thing today with water. The guys putting in our new countertops had to turn off the water for a while to install our new sink. Naturally that’s when I decided I needed to use the bathroom. I get soap all over my hands, turn on the water. Nothing. No prob! I think. I’ll just head outside and use the hose to rinse off. I spend a good minute and a half looking for the kink in the hose that’s blocking the water from coming out. Later I was making some rice cereal for baby Valentine. No sink. “I know!” I thought. “I’ll use the water dispenser on the fridge!” KAREN! For real?? Then after the guys went home and had turned the water back on, I started my dishwasher and got water all over the floor (because the entire sink is dismantled.) GUYS. What is wrong with me. I’m so excited about the kitchen though. We’ve been planning this kitchen renovation for over a year. We got the floors done last February (yeah, like, 2015…) and were going to do the rest right away. But then I got pregnant (and sick). Then we had a crazy busy summer. Then I had a baby. Aaaand here we are! Gettin it done! I’ve been doing lots of Instagram stories, follow along if you want to see kitchen pictures! My family generally agrees that the best thing to do with bing cherries is simply to eat them. They are so sweet. 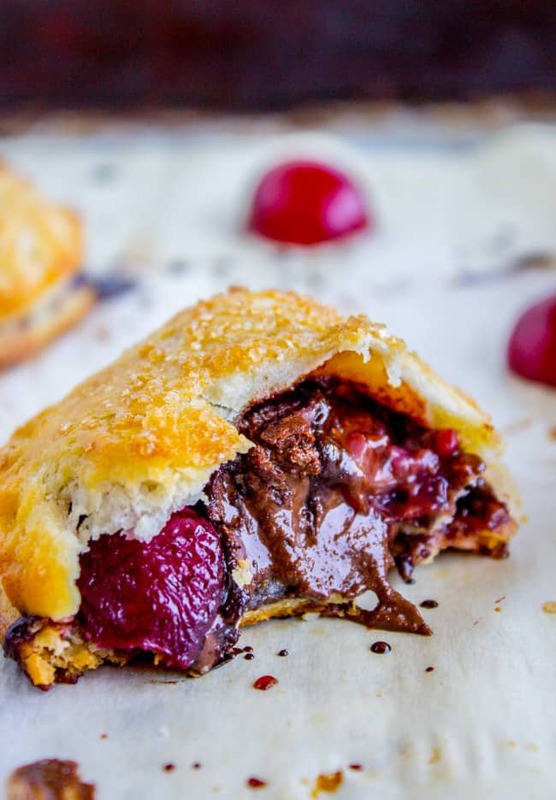 But I had leftover crescent roll dough and leftover chocolate from some other projects in the kitchen one day, and a big bowl full of cherries. So naturally I stuffed it all together. Then I decided to make it way better by using this easy pastry dough, which is so so so flaky. It’s unreal guys. The recipe uses all butter and you can tell. 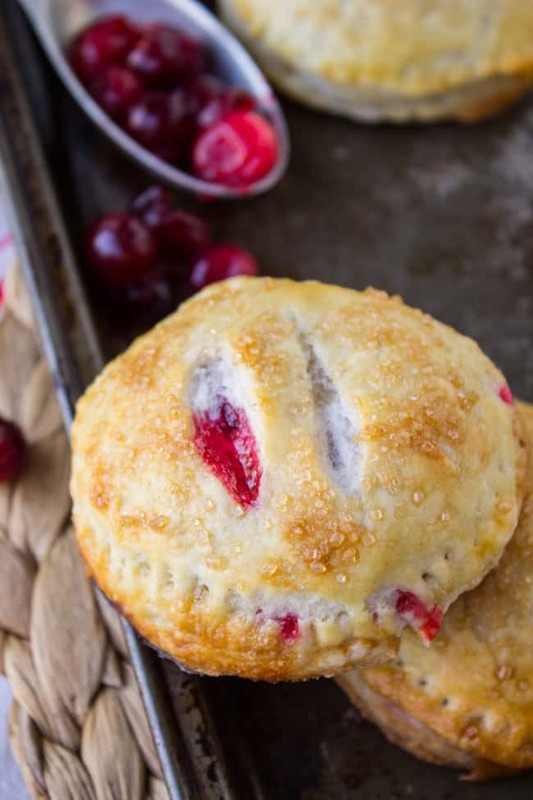 These pies are so great for a summer afternoon. Just make sure you let them cool enough before eating, they are basically like lava pies right out of the oven. If you make any of my recipes, share it on Instagram using the hashtag #TheFoodCharlatan so I can see it! I love that. Make the dough. 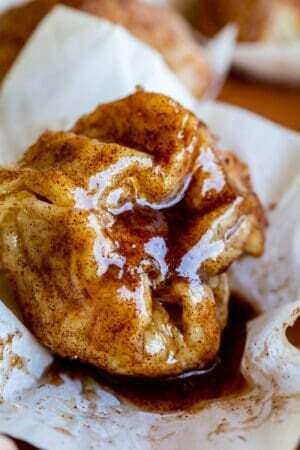 In a large bowl, combine 2 cups of flour with salt and baking powder. Use your hands or a pastry cutter (or pulse in a food processor) to cut the butter into the flour. You want it to be crumbled but still have pea-size pieces of butter. Sprinkle the top of the dough with flour. Roll the dough into an 8x10 inch rectangle. 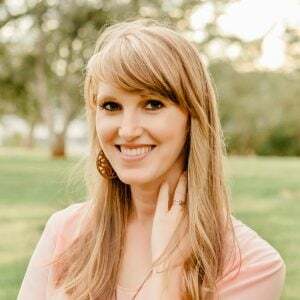 Grab both of the short ends and fold it over like a business letter (see photos). Rotate the dough 90 degrees. Roll the dough into another 8x10 inch rectangle. Fold it again like a business letter. 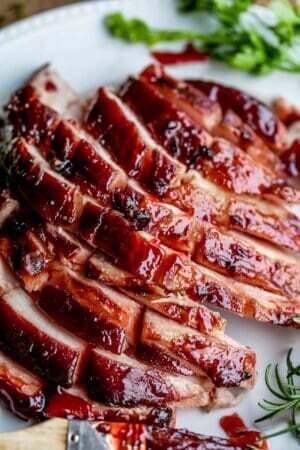 Wrap tightly in plastic wrap and refrigerate for 30 minutes at least (or overnight). Use a 3-inch biscuit cutter or similar sized glass to cut as many circles as you can out of the dough. Re-roll and cut as necessary until the dough is gone. In a medium sized, microwave safe bowl, add the chocolate chips and coconut oil. Microwave in 20-30 second intervals, stirring each time, until the chocolate is melted but still has lumps. Stir until the lumps are gone. Stir in the almond extract. The chocolate may seize up a bit, that's okay! You want the chocolate to be semi-solid. (See photos of sad pie attempt with liquid chocolate. Quite the mess.) At this point you can either try your hand at freezing or refrigerating the chocolate in short (1-5 minute) intervals, stirring in between, or just wait it out at room temperature. You want the chocolate to be malleable but not so liquidy that it squishes out the edge of your pie when you try to seal it. When your chocolate is scoop-able, use a spoon to add about a tablespoon of chocolate to the center of the shaped dough. Top with 4-5 cherry halves. Top each pie with another circle of dough. Pinch together with your fingers (pick it up if that makes it easier.) Keep the edges of the circle clear of chocolate. Set the pie on the pan and crimp the edges with a fork. In a bowl, whisk together the egg and 1 tablespoon water. 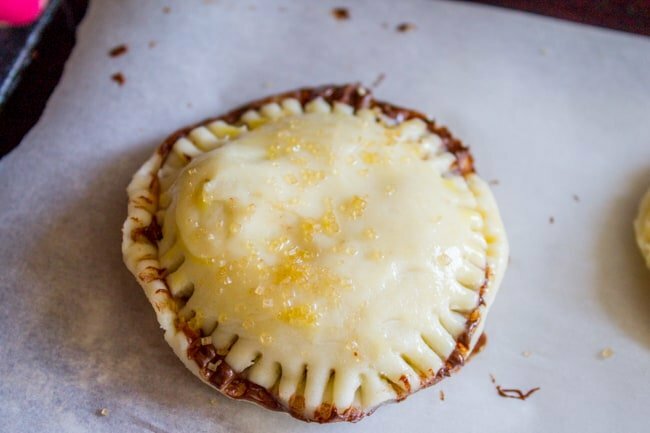 Brush the top of each pie with the egg wash.
Use a sharp knife to cut slits in the top of each pie. 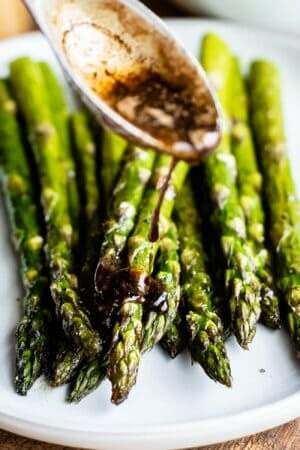 Sprinkle with sparkling sugar or raw sugar. Bake at 425 for about 13 minutes, or until they are brown on top. Let cool for 10-20 minutes before stuffing your face! *Have you ever tried the straw method for pitting? Cut a slit in the bottom of the cherry, then use a straw to push the pit out from the top (where the stem was). It works pretty well! You still look like you've committed cherry murder when you're done, but I think it's easier than slicing and then digging out the pit. 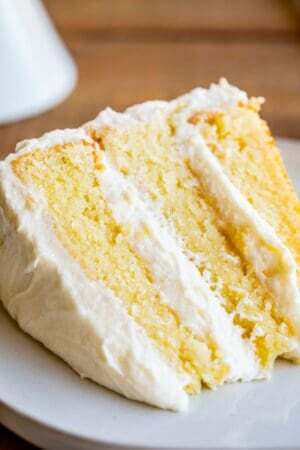 Source: The pastry recipe is from King Arthur Flour. It’s a good one! More summer desserts to love! 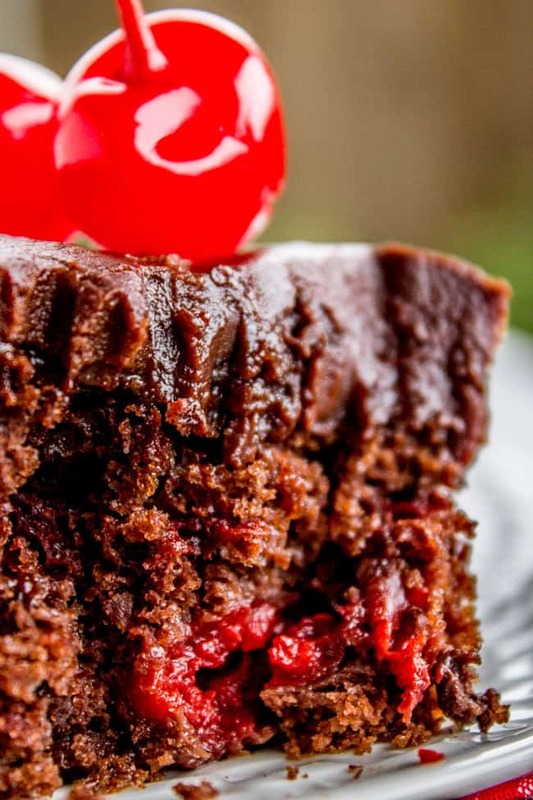 Chocolate Cherry Sheet Cake with Fudge Frosting << this is so easy! 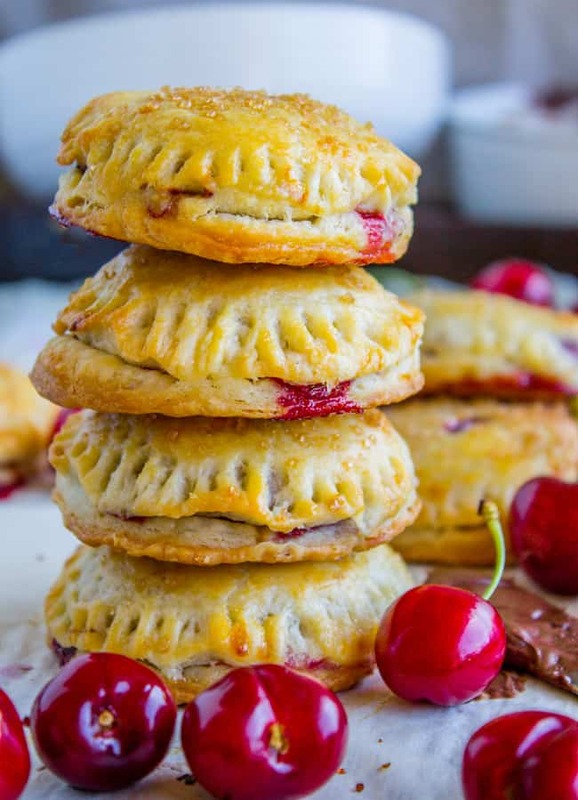 Cranberry Dulce de Leche Hand Pies << May sound like a weird combo but I swear by it. 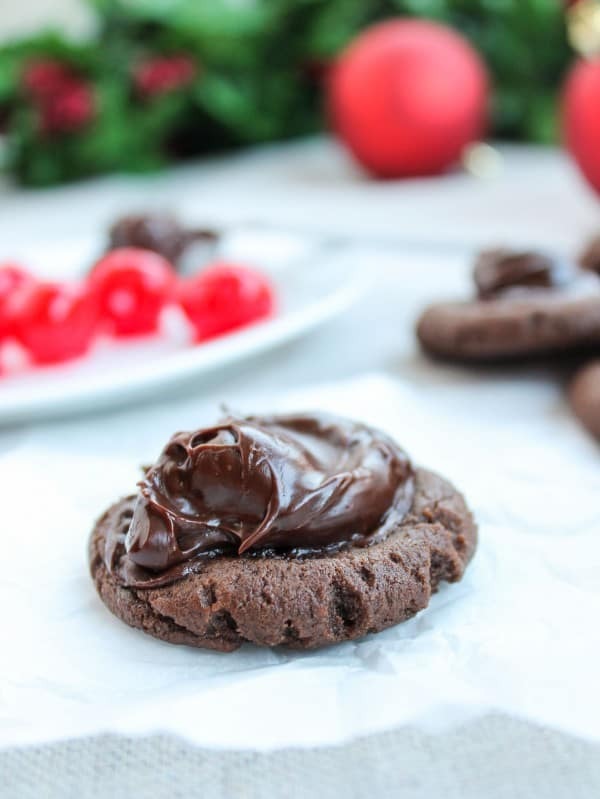 Buried Cherry Cookies << I make my brother a huge batch of these for his birthday every year! 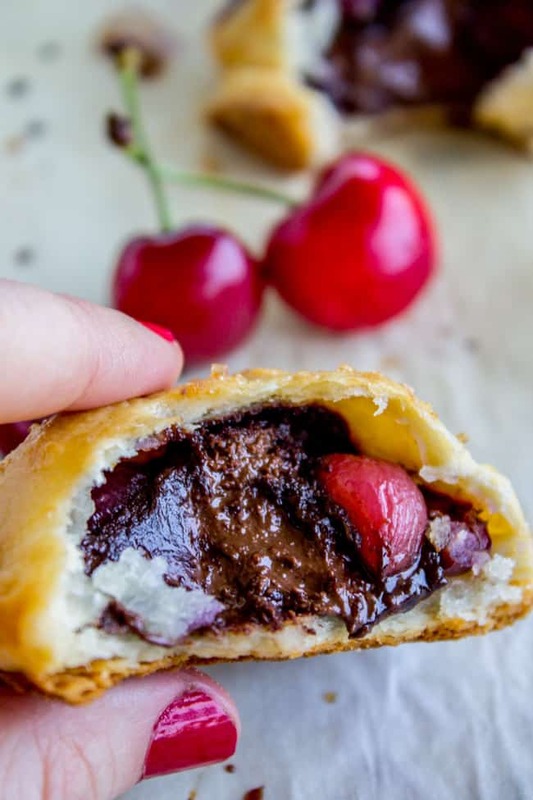 You will love these other chocolate cherry combos! Aw man where do you live Richard? 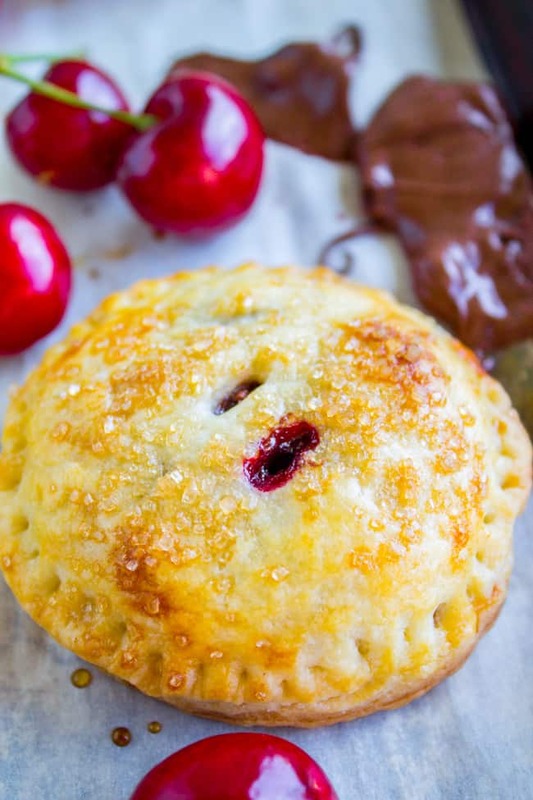 These pies might just be worth it! Hopefully you can find some on sale! Thanks for the comment! Butter, Lotsa Butter…I feel like maybe I should change my blog name to that. I bought a cherry pitter for about $6 a couple of years ago when cherries were in season, and it is worth every penny. I hated having to pit the cherries with a knife for my little kids but they refused to eat them otherwise. Plus they think it’s fun to help use the pitter. I love your recipes, thank you for the inspiration! 6 dollars! That’s totally worth it! I should get one. Thanks for the tip Laura! Hope you enjoy cherry season!